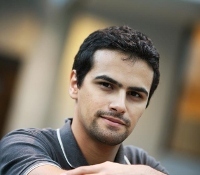 I completed my Bachelor's Degree in Computational Mathematics at the Federal University of Minas Gerais, in Brazil in 2009, and now pursuing a Master's Degree in Aalto University School of Science. Member of the Distributed Computation group in the Laboratory for Theoretical Computer Science. Research interests: cloud computing infrastructure and software. A. Medeiros. HAcid: A lightweight transaction system for HBase. Master's thesis, Aalto University School of Science, 2012. A. Medeiros. ZooKeeper's atomic broadcast protocol: Theory and practice. Student Project in Theoretical Computer Science, at Aalto University School of Science, March 2012. A. C. Medeiros, S. Urrutia. Discrete optimization methods to determine trajectories for Dubins' vehicles. Electronic Notes in Discrete Mathematics, Volume 36, 1 August 2010, Pages 17-24. ISCO 2010 - International Symposium on Combinatorial Optimization.